Arctic Summer Sea Ice Growth Trend Extends Another Year …Greenland Summer One Of Coldest In 30 Years! 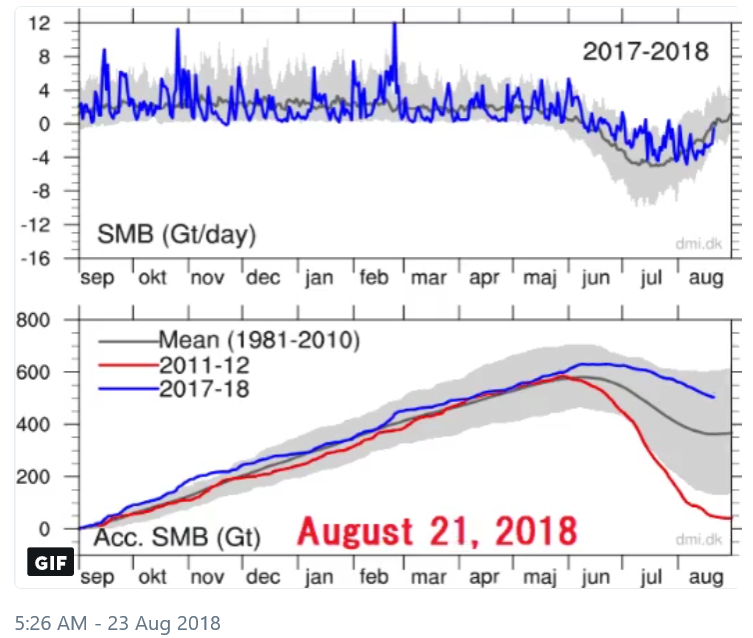 Browse: Home / 2018 / August / 24 / Arctic Summer Sea Ice Growth Trend Extends Another Year …Greenland Summer One Of Coldest In 30 Years! As the Arctic summer ice melt approaches its peak, we can say with high certainty that this year’s ice melt will extend the trend of a rebounding Arctic ice mass by another year. Our Japanese skeptic blogger and good friend Kirye reports using the data from the Danish Meteorological Institute (DMI) that peak summer Arctic sea ice volume upward growth trend has been extended yet another year – now 12 years. Chart by Kirye. Data source: Danish Meteorology Institute (DMI). 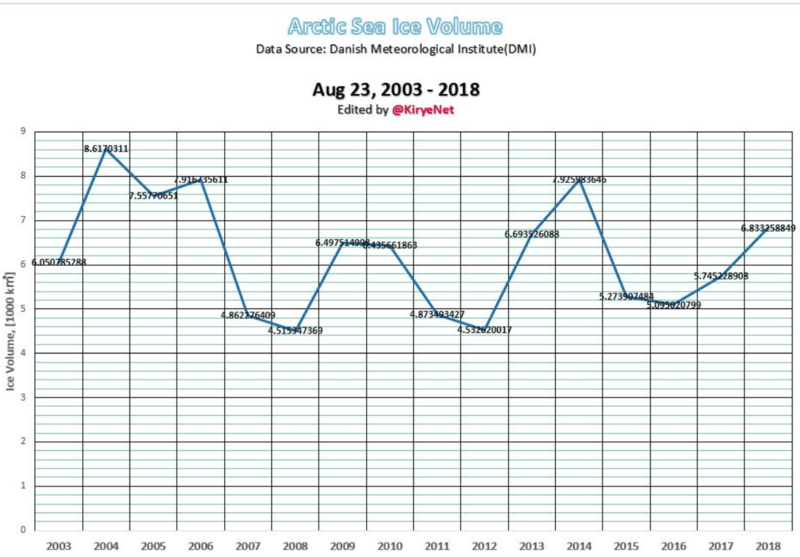 Thus Arctic sea ice melt has defied the hysterical claims of disappearing sea ice made since the release of Al Gore’s climate propaganda film An Inconvenient Truth, shocking a number of experts. Naturally alarmists, wishing all this good news away, like to roll out the PIOMASS chart to keep the alarms on life support. However, the PIOMASS chart conveniently only goes back to the peak of Arctic sea ice, 1980. As the above chart shows, Arctic sea ice extent was similarly low some 90 years ago, a time when atmospheric CO2 was at what we are told are climatically very “safe levels”. 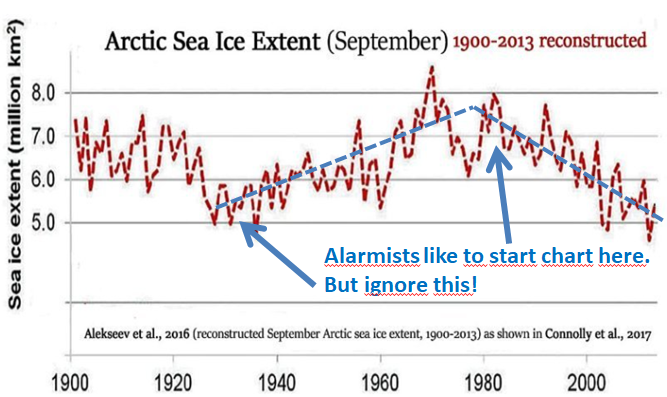 Obviously CO2 has virtually nothing to do with Arctic sea ice extent. Rather it behaves in response to other far more powerful natural cycles, namely oceanic cycles. Arctic sea ice extent is clearly driven by the natural temperature cycles of the North Atlantic. Obviously the correlation between cyclic North Atlantic sea surface temperatures and Arctic sea ice extent are stunningly strong. 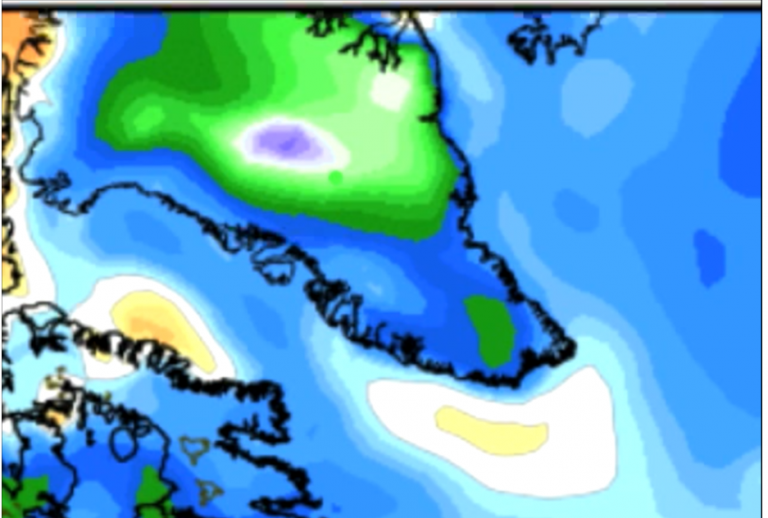 Greenland forecast to stay much colder than normal. Image cropped from WeatherBell August 23, 2018 Daily Update. This is from a translation of the DMI page on climte. “The world and Denmark’s climate is constantly evolving. In the past, today and especially in the future. Because to the climate adept the future is even more “especially” known than today, and if you want to know what it has in store, the DMI shills for warmism will gladly inform you of what the IPCC swamis opine from their crystal balls. And it isn’t just the Danes. It’s everyone. It’s official. The world has gone insane. 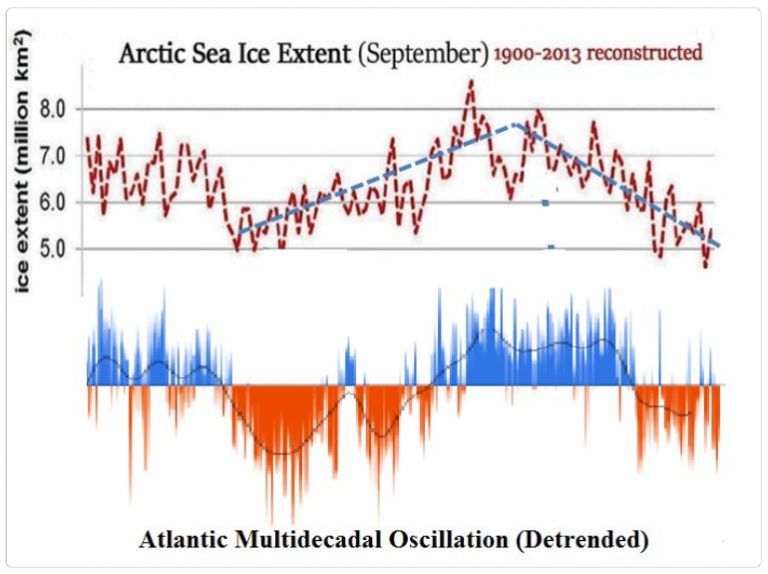 Arctic sea ice controlled by AMO. That is very questionable. Greenland Summer One Of Coldest In 30 Years! For quite a few of those states summer afternoons have been cooling since the 19th century. Nothing to see there, i.e., no change since 1900. Wow. Yawn. Thanks. And that’s probably doctored data, too, with past cooled and present warmed. And even if not it’s a sobering testimony, not only to the lack of warming, but to warmists’ lack of integrity. ASIDE testing link to graph. The effect of the AMO can be shown right through the LIA. The chart shows red blobs at dips in sea ice extent above Iceland, in response to the peak of the AMO cycle. The North West Passage is also late to the party. Canadian Coast Guard is advising pleasure craft to avoid as their icebreakers cannot guarantee safe transit. Nope, that is not a depiction of the extent going back to 1900. That is one reconstruction among many and other reconstructions don’t show this dent in the 1930s. And of course you know it is pretty difficult to compare accurate satellite data with data like this, right? No, it didn’t. The SMB is not a net value for the ice sheet mass. 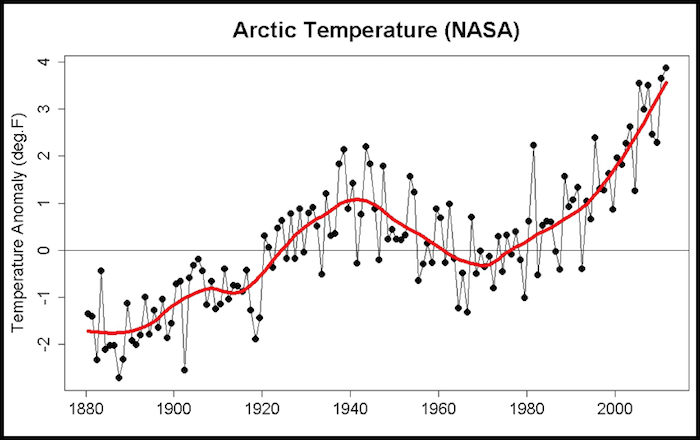 Are you telling us that Arctic sea ice is NOT driven by temperatures? ???? really ?? That would DESTROY the AGW meme. Get back to us when someone sails through the Larsen route like in 1944. All the small boats had to turn back this year, because of TOO MUCH SEA ICE in the NWP. 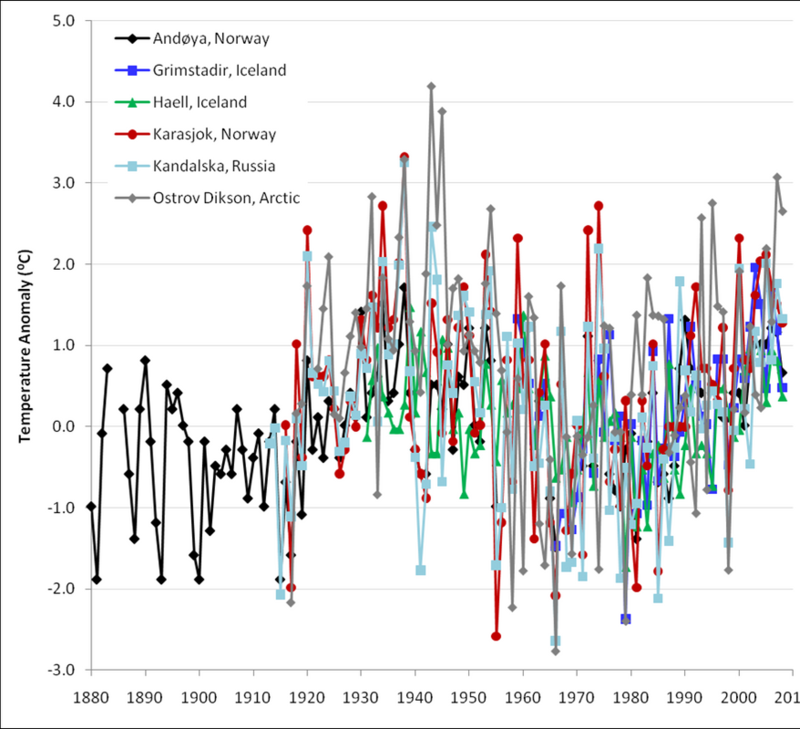 Are you DENYING that the 1970s was a time of PEAK Arctic sea ice? Greenland has had a HUGE SMB gain over the last two years. There is NOTHING your mindless ranting can do about it. Are you DENYING that even after the recovery from that peak, the current Arctic sea ice is still pretty much in the TOP 10% of the last 10,000 years? Are you a CLIMATE CHANGE DENIER? ZERO sign of any CO2 warming effects anywhere in the Arctic, seb..
.. just the NATURAL cycle of the AMO on top of a NATURAL RECOVERY out of the coldest period in 10,000 years. No sign of CO2 warming ANYWHERE for that matter..
CO2 gets wise, bypasses middle man. Impatient for us to see it’s affect on ice, it has gone straight to melting it without having to wait for temperature to come off break. Temperature is such an outmoded concept anyway, not always (hardly every) keeping in step with CO2. Also, for those who haven’t seen it, here’s the vid from Tony Heller on why warmists start their hysteria in 1979, i.e., they cherry pick the time frame that suits their agenda. Are you saying these scientists are wrong? It has SMB gains in every year. It would be strange if that weren’t the case. 2011/12 came very close to such a year, but that is not the norm. The norm is a SMB gain of around 400 Gt per year. Are you DENYING that even after the recovery from that peak, the current Arctic sea ice is still pretty much in the TOP 10% of the last 10,000 years? Are you a CLIMATE CHANGE DENIER? Here’s a paper for the last ~1000 years. All this whataboutism of you guys is really strange behaviour. Let’s assume what you say is correct … how does that change the fact that sea ice was pretty stable for hundreds of years and now rapidly declines in extent? You guys are “post truth” at best. Those are “adjusted” temperatures , seb, not REALITY.. you really are getting very WEAK in your farce. With all that sea ice, how did Larsen sail the Prince of Wales Strait in 1944, which hasn’t been sailed since. How come the OBSERVED sea ice off Iceland dropped dramatically from 1920-1970? Take another faceplant , seb. Totally in line with a warmer period out of the LIA (COLDEST PERIOD IN 10,000 years) and the AMO cycle. Absolute ZERO EVIDENCE of any warming from CO2 anywhere, anytime. Seb, you have been totally unable to counter one thing Tony Heller has even said in a video..
Because he tells the truth. You lack any actual TRUTH, seb..
.. as much as you lack any evidence. It is not in your nature to accept or tell the truth. In 3.4 of the little sea ice collusion fabrication, they use a short period of the Icelandic Sea ice index. Let’s have a look at that index in full. The result does not match DOE records. It does not match the Icelandic sea ice record. It does not match early satellite records. It does not match historical accounts. It does not match real Arctic temperatures. I thank you for presenting it, because its shows that YES, there is MASSIVE COLLUSION to propagate the AGW scam. Sebastian, could we ask you to put some flesh on the bare bones of your statement that there are other sea ice reconstructions apart from the one given in the image in the post. The correlation of AMO and sea ice looks remarkable as given, but if you could provide one or two alternatives it would give us a chance to see how wide is the spread of reconstructed historical sea ice. Fair enough, if you consider that’s the equivalent of what Michael Mann did when he created his infamous hockey stick graph. You know, by stitching two different proxies – tree ring growth and instrumental thermometer records – together, and implying that each represents the other when there’s no evidence that’s the case. More importantly is WHY Mann did that. He used the instrumental record at the end because the tree ring data told a different story. I’m waiting for Sebastian before I comment. I am tired of waiting. I demand that the global warming freaks announce the beginning of our new ice age so we can get it over with.